A grab bag of essays exploring the South’s foodways, music traditions, architecture, urban planning and history in general, from a vantage point in Charlotte, North Carolina. Charlotte food adventurers know Central Avenue and South Boulevard as hot spots for international eating. But have you discovered the Albemarle Road corridor? The east Charlotte avenue, shooting off from Independence Boulevard, is what I call a “salad bowl suburb.” Businesses aren’t sorted by ethnicity but instead mix randomly like veggies in a tossed salad. Delve into the jumble of unremarkable looking suburban plazas and you’ll discover a global array of mom-and-pop eateries. Here are my personal favorite small bites along the Albemarle Road corridor — each under $5. And this is just a start. Explore the Bhutanese groceries at Central Market. Sit down to an Indian feast at Woodlands Pure Vegetarian. Sip Turkish coffee at new Layaly Cafe. The world awaits you. 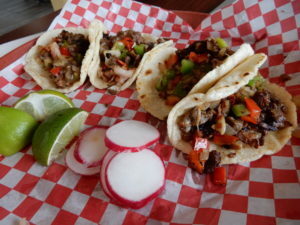 Alambre tacos with bacon and beef at Las Meras Tortas are just $1.90 each. Mexican bacon tacos: Las Meras Tortas. The menu calls these Alambre and says they are kabobs. But it’s bacon, lovely bacon, with grilled onions, bell peppers, ground beef and a whisper of melted cheese. The corn soft tortillas are small, only $1.90 apiece, so get three or four if you are hungry. 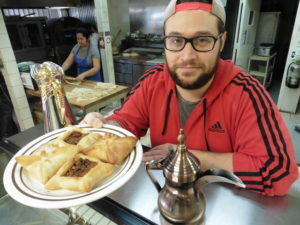 Seven days a week 10 a.m. – 10 p.m.
Zech Azazi at Golden Bakery serves up a plate of fatayeh meat pies. Open every day, but the best time is Friday afternoon after midday prayers at Charlotte’s mosques. That’s when sambousas sometimes appear. They look like empanadas — delicately spiced beef or chicken in a crescent of thin pastry. No sambousas? Get the four-cornered meat pies called fatayeh. 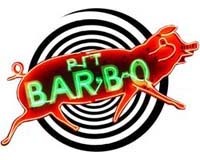 Seven days a week 9 a.m. – 10 p.m.
3145 N. Sharon Amity Rd. Super-flakey rectangles of golden pastry filled with a slurry of beef or chicken. I love going on Saturday, their busiest day, to hear Caribbean accents as I wait in line. 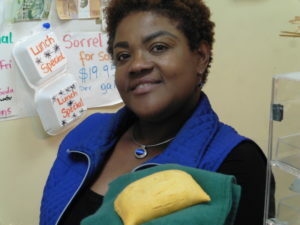 Saturday 9 a.m. – 8 p.m.
At Delicias Restaurant Latino, a Honduran baleada, left, is just $2. 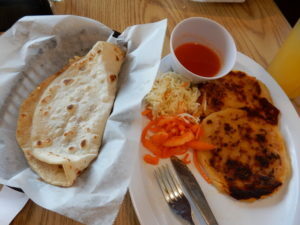 At right are two Salvadoran pupusas, $1.90 each. The baleada is the Honduran cousin of the quesadilla, a folded flour tortilla loaded with beans as well as cheese. It’s not a small bite, technically, because a single $2 baleada will fill you up. Seeking something smaller? Go with a pupusa. It’s a Salvadoran staple, a corn pancake stuffed with chopped pork and cheese. 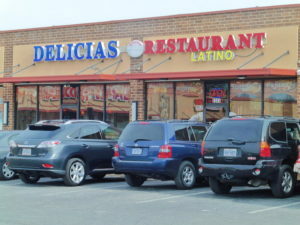 Honduran-owned Delicias Restaurant Latino at 6341 Albemarle Road specializes in food from Central America. 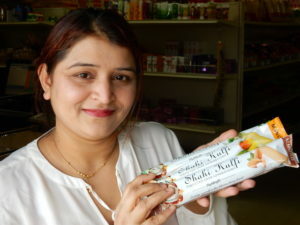 Seven days a week 8 a.m. – 10 p.m.
Meena Chamlagai shows off South Asian style ice cream bars, $1.99 each at Rohan Grocery. Charlotte’s most recent immigrant wave comes from Himalaya mountain countries adjoining India. Rohan offers traditional clothing, hand-hammered cookware and familiar foods. You’ll want to dip into the freezer by the front door for ice cream bars in flavors of mango, almond, pistachio or coconut. 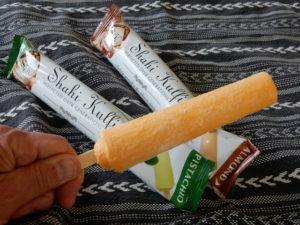 Rohan Grocery, just off Albemarle Road, offers a wide array of goods from south Asia including Shahi Kuffi ice cream. Seven days a week 9 a.m. – 8 p.m.